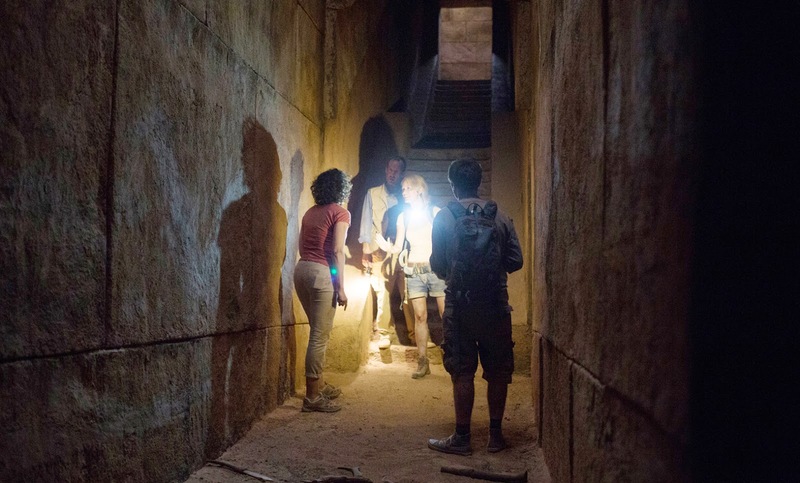 A team of archaeologists along with select media dared to enter one of the most mysterious creations of man in “The Pyramid” where they battle horrific circumstances and creatures trying to come out alive. Directed by renowned Gregory Levasseur who came to fame with his horror-slasher hit films such as “High Tension,” “The Hills Have Eyes,” “Mirrors” and “Piranha 3D” – most of which he co-wrote with long-time collaborator Alexandre Aja who serves as producer of the film, “The Pyramid” poises to be another of the duo’s jolting thriller – guaranteed to leave the viewers shuddered after viewing. To heighten the scares and intensity, the filmmakers worked to ensure the authenticity of the story’s backdrop amidst Egypt’s recent political turmoil that erupted when Muslim Brotherhood’s Mohamed Morsi became President of Egypt. “Setting against these recent protests immediately places the movie in the real world,” says producer and editor Scott C. Silver. The documentary-style framing device does add a certain immediacy that Levasseur and director of photography Laurent Tangy were keen to exploit. “I’m not at all precious about breaking the rules in service to the story,” says Tangy. “The Pyramid” opens December 10 in cinemas nationwide from 20th Century Fox to be distributed by Warner Bros.